This manuscript describes the copy number variation analysis performed in serum or plasma DNA using real-time PCR approach. This method is suitable for the prediction of drug resistance in castration resistant prostate cancer patients, but it could be informative also for other diseases. Salvi, S., Conteduca, V., Martignano, F., Gurioli, G., Calistri, D., Casadio, V. Serum and Plasma Copy Number Detection Using Real-time PCR. J. Vis. Exp. (130), e56502, doi:10.3791/56502 (2017). Serum and plasma cell free DNA (cfDNA) has been shown as an informative, non-invasive source of biomarkers for cancer diagnosis, prognosis, monitoring, and prediction of treatment resistance. Starting from the hypothesis that androgen receptor (AR) gene copy number (CN) gain is a frequent event in metastatic castration resistance prostate cancer (mCRPC), we propose to analyze this event in cfDNA as a potential predictive biomarker. We evaluated AR CN in cfDNA using 2 different real-time PCR assays and 2 reference genes (RNaseP and AGO1). DNA amount of 60 ng was used for each assay combination. AR CN gain was confirmed using Digital PCR as a more accurate method. CN variation analysis has already been demonstrated to be informative for the prediction of treatment resistance in the setting of mCRPC, but it could be useful also for other purposes in different patient settings. CN analysis on cfDNA has several advantages: it is non-invasive, rapid and easy to perform, and it starts from a small volume of serum or plasma material. Circulating cell free DNA (cfDNA) in blood has been demonstrated to be an optimal source of biomarkers for cancer diagnosis, prognosis, monitoring, and prediction of treatment resistance1,2. Many studies have shown a good concordance between DNA alterations (mutations, copy number variations, epigenetic modifications) in tissues and those found in corresponding plasma samples1, confirming that circulating tumor DNA (ctDNA) is informative for primary and metastatic tumor tissue alterations3. The possibility of studying ctDNA thus allows for the reconstruction of genomic rearrangements and copy number variations (CNVs) at specific oncogenes4, identifying potentially metastatic clonal and subclonal cells. CtDNA has been shown to be clinically useful especially for cancer treatment monitoring as it harbors specific mutations and CNVs, related to specific targeted therapies5,6. It also overcomes the need for tissue biopsies and allows results to be obtained at different times during a specific cancer treatment in a non-invasive manner. 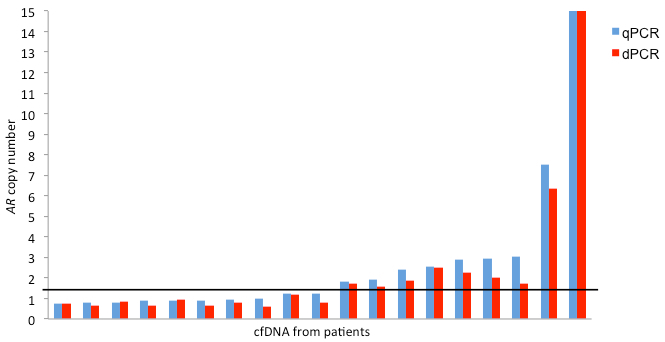 With regard to prostate cancer, a significant correlation between circulating cell-free androgen receptor (AR) CNVs and treatment response to abiraterone and enzalutamide has been shown, indicating AR gene copy number (CN) in cfDNA may be a promising biomarker capable of predicting treatment resistance7,8,9,10,11. CNVs of specific genes in ctDNA can be evaluated using different approaches with different sensitivity, cost, and rapidity (e.g. real-time, Digital PCR, and Next Generation Sequencing). Here we describe a simple and fast approach, based on duplex assays in real-time PCR technology, for evaluating AR CN in cfDNA from serum and plasma samples7,8. We considered two different PCR assays designed on two different genomic regions within intron 5 of AR (Xq12) and two other genes, as internal standard reference genes known to have a normal copy number status in prostate cancer (RNaseP, located on 14q11; AGO1, located on 1p34). We selected two reference genes, rather than one, to increase the precision and sensitivity of the results. A DNA amount of 60 ng was amplified for each assay combination (combined assay for AR-assay_1+RNaseP and for AR-assay_2+AGO1). Three serum or plasma DNA samples from healthy males were pooled and used as a calibrator. We considered cutoffs of >1.5 for AR gain and <0.5 for deletion. One of the main advantages of this method is that it is flexible and that other genes can also be evaluated, changing the standard internal reference genes, on the basis of tumor type and characteristics. The protocol consists of the isolation of DNA from serum or plasma samples to perform real-time PCR for copy number analysis. DNA extraction, DNA quantity control (spectrophotometer) and real-time PCR for specific targets were performed. In Figure 1, a summary of the procedures and time line are reported. The protocol follows the guidelines of IRST Human Research Ethics Committee. Collect approximately 5 mL whole blood in a serum tube without anticoagulant to obtain serum. Maintain blood tubes at 4 °C until processing. Centrifuge tubes at 1,000 x g for 15 min at 4 °C. Carefully transfer serum into 2 mL tubes. Discard the collecting tube and immediately freeze the supernatant at -80 °C until use. Collect approximately 10 mL whole blood in a plasma tube with EDTA to obtain plasma. Fill the tube completely and then invert it 8 times. Maintain blood tubes at 4 °C until processing. Centrifuge the tube at 1,800 x g for 15 min at room temperature with no brake setting on the centrifuge. Carefully transfer the upper part of the plasma into 2 mL tubes. Repeat the transfer, leaving at least 1 mL of the supernatant above the white cell layer. NOTE: Transferring the upper part of the supernatant reduces the risk of contamination by cells or cell debris. NOTE: Isolation of DNA from serum or plasma should be performed using the commercial protocol modified in the following steps. Thaw one aliquot (containing from 0.5 to 2 mL) of serum or plasma at room temperature. Vortex and mix the sample and transfer 0.5 mL of serum or plasma into a clear 1.5 mL tube. Freeze the rest of material at -80 °C. Add 50 µL of proteinase k (20 mg/mL) directly to the sample. Add 0.5 mL of lysis buffer to the sample and mix well by pipetting. Close the tubes and incubate samples at 56 °C for 15 min in the heat block. Add the indicated amount of 100% ethanol at wash buffer 1 and 2, as indicated by the manufacturer's instructions. Bring the samples back to room temperature and add 0.5 mL of absolute ethanol and mix well by pipetting. Add 650 µL of the mixture obtained in step 3.7 to the separation column and centrifuge at 6,000 x g for 1 min. Discard the tube containing the flow through and place the column on a new clean collection tube. Repeat steps 3.8 and 3.9 one more time. Add 500 µL of wash buffer 1, without wetting the rim of the column and centrifuge at 6,000 x g for 1 min. Discard the tube containing the flow through and replace it with a new clean collection tube. Add 500 µL of wash buffer 2, without wetting the rim of the column and centrifuge at full speed (20,000 x g) for 3 min. Centrifuge at full speed (20,000 x g) for 3 min to remove any residual washing buffer. Place the column into a clean 1.5 mL tube. Add 150 µL of elution buffer and wait 7 min to ensure that buffer wets the column. Centrifuge at 8,000 x g for 1 min. Pipette the elute from step 3.16 again into the same column and centrifuge at full speed (20,000 x g) for 1 min to ensure maximum recovery of DNA. Perform quantification of DNA using a spectrophotometer. Use 2 µL of sample on a bench-top spectrophotometer per the manufacturer's instructions. NOTE: If the DNA quantity is not sufficient to proceed with real-time PCR (at least 120 ng), perform a new DNA isolation process. Dilute DNA from serum or plasma to 2.5 ng/µL in a final volume sufficient for all real-time PCR (about 50 µL). Thaw copy number assays, reference gene assay, DNA diluted samples, and calibrators pooled in ice. Equilibrate at room temperature the master mix that is stored at 4 °C. Prepare a mix of 1 µL of target assay, 1 µL of reference gene assay, and 10 µL of master mix for 3 replicates of each sample and calibrators pooled. Prepare the mix including a negative control (water) and 2 extra samples. In a 96 well plate, aliquot 12 µL of the mix into each well. Do not pipette or spin tubes. Add 8 µL (concentration of 2.5 ng/µL) of each DNA sample and calibrators pooled into each well. Do not pipette or spin tubes. Change the tip for each well. NOTE: 30 DNA samples can be processed for each Real-time experiment using the 96-well plate: 30 x 3 samples + 1 x 3 calibrators pooled + negative control = 94. 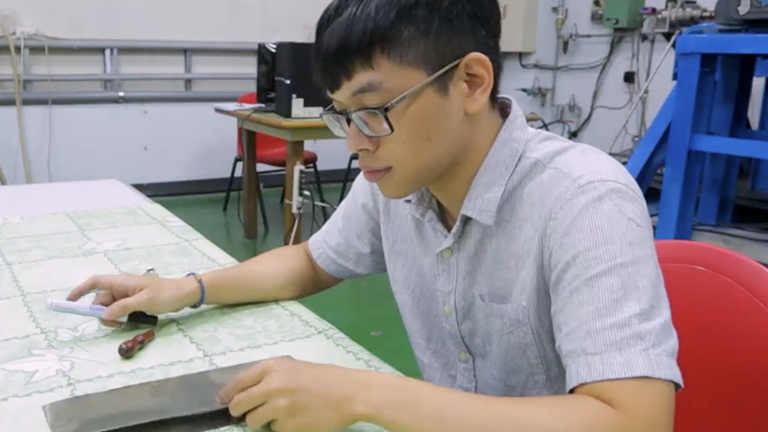 Briefly spin down the plate at 1,000 x g.
Run the plate using the following protocol: hold stage at 95 °C for 10 min, 40 cycles at 95 °C for 15 s, and 60 °C for 1 min. In the section "option", below the amplification plot results, set the Ct threshold at 0.2 for the first target gene analyzed. Repeat the set for each target or reference genes. To Export the real-time PCR file in .txt extension, press "Export" into toolbar. Flag only "results" in the select data to export → choose as file type the extension .txt → press "start export" → close the export tool. Open the analysis software and import the file .txt (toolbar → import). Select the file name to analyze and select the analysis setting by toolbar (play symbol). Specify the calibrator sample and the known number of copies of the target (e.g., 1 copy for AR gene). Press "apply." For each sample, omit one well with different delta Ct (ΔCt) in comparison with other wells. Reanalyze the experiment (press play symbol). Evaluate the results by the copy number bar plot or the table. NOTE: The results table contains numerous parameters like confidence, Z-score, and replicates analyzed that could be useful for results interpretation. Total cfDNA concentration was quantifiable by spectrophotometry for all samples analyzed, showing a median of 6.12 ng/µL (range: 2.00 - 23.71 ng/µL) for serum samples and a median of 3.21 ng/µL (range: 2.31 - 8.49 ng/µL) for plasma samples. We analyzed a total of 115 samples by real-time PCR experiments. Test sensitivity was assessed using mixed serum DNA from patients with high or low gain for AR, and DNA from healthy donors, which are also used as calibrator samples for copy number analysis. As represented in Figure 2, AR CN is sufficiently detected in 0.375% of DNA from patients with AR gain mixed with healthy donor DNA to obtain a gene gain detectable (Figure 2). Thus, this approach detected a very low amount of copy number gain. The standard deviation of ΔCt in CN assays for each patient were calculated (median ± SD= 0.1, range: 0.00 - 0.36). We used a median of the standard deviation values for choosing copy number gain cutoff. We analyzed the copy number of AR in patients treated with abiraterone (n = 53), finding 16 (30.2%) patients exhibited AR gain7. Similarly, we analyzed the copy number variation for AR gene in patients treated with enzalutamide (n = 59), finding AR gain in 21 (36%) of patients8. Moreover, we evaluated the association between AR CN and clinical outcomes using the Kaplan-Meier method and log-rank test and found a significant association. In particular, abiraterone treated case series patients with AR gene gain showed a median progression free survival (PFS) of 2.8 vs. 9.5 months of non-gained cases (p <0.0001). A lower overall survival (OS) was also reported in patients with AR CN gain (p <0.0001). Similarly, for enzalutamide case series, we found a median PFS of 2.4 vs. 4.0 months for patients with AR gain vs. patients with no gain (p = 0.0004). Moreover, median OS of patients with AR CN gain was 6.1 vs. 14.1 months for those without gain (p = 0.0003). 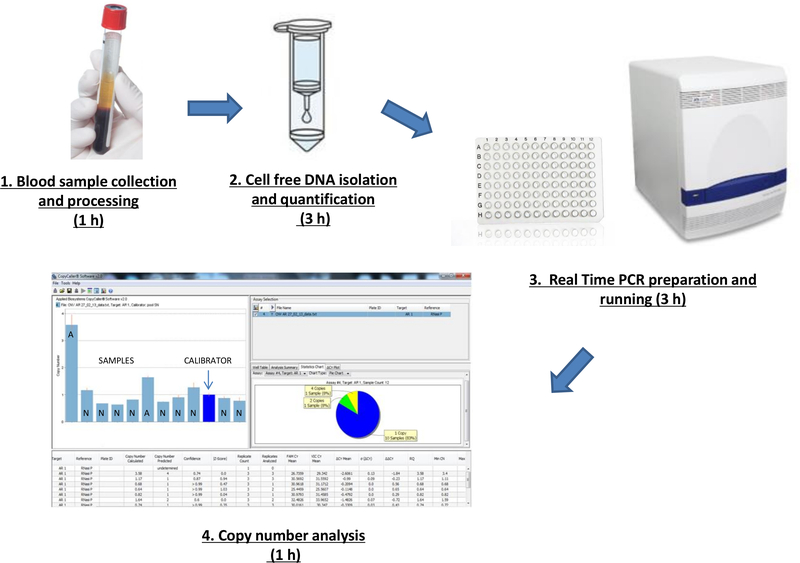 All AR CN gain results obtained from the real-time PCR approach were confirmed using other methods, including digital PCR (Figure 3). Figure 1. Workflow and timeline. The method workflow is divided into different steps and times. Please click here to view a larger version of this figure. AR CN analysis in serum and plasma sample represents a new, non-invasive approach for the stratification of castration resistant prostate cancer (CRPC) patients. It has been recently demonstrated that the AR CN is able to predict outcomes in CRPC patients treated with abiraterone and enzalutamide, before and after chemotherapy7,8,9,10. The main advantage of our approach is that the protocol is very simple to perform, consisting of only a DNA isolation process, one real-time PCR analysis and easy data interpretations. Moreover, the test could be quickly performed in 1 working day, and the procedure is inexpensive ($20 USD for each sample, approximately). We have demonstrated that this method is highly reproducible and the results obtained are in line with those coming from more expensive and accurate methods, including digital PCR7,8. Moreover, we found a similar AR gain frequency detected with targeted NGS approaches on plasma samples treated with abiraterone9,10. Another important advantage is that this approach is flexible and could be applicable to other diseases in which the AR gene has an important role. Furthermore, other target and reference genes could be chosen based on the disease of interest. CN analysis of the AR gene in serum has also some limitations. Firstly, the DNA spectrophotometric quantification method is often imprecise and could be replaced with other, more accurate fluorometric approaches. A more precise quantification could give more precise CN results. Secondly, some studies have suggested that it could be better to analyze plasma DNA instead of serum DNA. The quantity of circulating cell free DNA is generally higher in serum than in plasma12,13, due to the clotting of white blood cells in serum, suggesting that serum is potentially a worse source for tumor-specific DNA analysis because of the possible presence of wild-type DNA. CN analysis of the AR gene in serum using real-time PCR approaches has been performed on 112 CRPC patients before they started treatment with either enzalutamide or abiraterone. Our data showed that AR CN on cfDNA is a powerful genetic biomarker of clinical outcome and resistance to abiraterone and enzalutamide, and can be used to identify men who might benefit a priori from anti-AR therapies or chemotherapy using a rapid and low-cost PCR assay. These findings highlight the utility of studying blood as a minimally invasive method for interrogating mechanisms of therapeutic resistance in both early and advanced CRPC. In the future, prospective and larger studies should stratify patients by circulating AR status in view of the subsequent differences in clinical outcomes and treatment response. We thank Chiara Molinari and Filippo Martignano for support in data analysis. Salvi, S., et al. Cell-free DNA as a diagnostic marker for cancer: current insights. Onco Targets Ther. 9, 6549-6559 (2016). Heitzer, E., Ulz, P., Geigl, J. B. Circulating tumor DNA as a liquid biopsy for cancer. Clin. Chem. 61, (1), 112-123 (2015). Murtaza, M., et al. Non-invasive analysis of acquired resistance to cancer therapy by sequencing of plasma DNA. Nature. 497, (7447), 108-112 (2013). Heitzer, E., Ulz, P., Geigl, J. B., Speicher, M. R. Non-invasive detection of genome-wide somatic copy number alterations by liquid biopsies. Mol. Oncol. 10, (3), 494-502 (2016). Diaz, L. A. Jr, et al. The molecular evolution of acquired resistance to targeted EGFR blockade in colorectal cancers. Nature. 486, (7404), 537-540 (2012). Dawson, S. J., et al. Analysis of circulating tumor DNA to monitor metastatic breast cancer. N. Engl. J. Med. 368, (13), 1199-1209 (2013). Salvi, S., et al. Circulating cell-free AR and CYP17A1 copy number variations may associate with outcome of metastatic castration-resistant prostate cancer patients treated with abiraterone. Br. J. Cancer. 112, (10), 1717-1724 (2015). Romanel, A., et al. Plasma AR and abiraterone-resistant prostate cancer. Sci. Transl. Med. 7, (312), (2015). Conteduca, V., et al. Androgen receptor gene status in plasma DNA associates with worse outcome on enzalutamide or abiraterone for castration-resistant prostate cancer: a multi-institution correlative biomarker study. Ann Oncol. (2017). Attard, G., Antonarakis, E. S. Prostate cancer: AR aberrations and resistance to abiraterone or enzalutamide. Nat. Rev. Urol. 13, (12), 697-698 (2016). Lee, T. H., Montalvo, L., Chrebtow, V., Busch, M. P. Quantitation of genomic DNA in plasma and serum samples: higher concentrations of genomic DNA found in serum than in plasma. Transfusion. 41, (2), 276-282 (2001). Chan, K. C., Yeung, S. W., Lui, W. B., Rainer, T. H., Lo, Y. M. Effects of preanalytical factors on the molecular size of cell-free DNA in blood. Clin. Chem. 51, (4), 781-784 (2005).